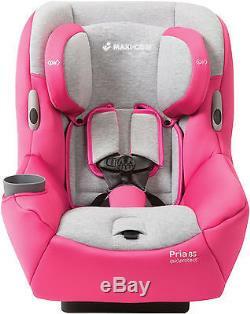 Maxi-Cosi 2016 Pria 85 Air Convertible Car Seat in Passionate Pink Brand New Unopened Box! Surround your child in comfort with the Maxi-Cosi Pria 85 Convertible Car Seat. The Pria 85 is the only premium convertible car seat that offers a first-class ride from 14-85 pounds. Featuring CosiCushion premium fabrics and padding, the Pria 85 provides the most comfort for your child during the journey. The Pria 85 is also specially designed to fit better in your car, allowing more room for your passengers to stretch out in the front seats. It fits your real life too. Keeping the Pria 85 clean is simple. The seat pad unsnaps and removes easily over the frame. Theres no need to remove the seat from the car or to make complicated maneuvers with the harness straps. The Pria 85 seat pad is both machine washable and dryer safe. All this allows you to get a thorough clean not available in other car seats. Getting your child in and out of the Pria 85 has been simplified, with handy harness holders to keep the harness straps out of the way. It fits children rear-facing starting at 14 pounds and keeps them cozy up to 40 pounds. When they're ready to ride forward-facing, turn this car seat around to safely fit children up to 85 pounds; the highest weight range offered by a convertible car seat. Both stages benefit from the safer side impact protection provided by Air Protect® technology which protects your child where its needed most, around the head. What makes this product unique? Headrest and harness adjust easily without rethreading. Handy harness holders keep harness straps out of the way for easy boarding. Deep rear-facing adjustment, making it easier and faster to correctly install in rear-facing position. Extended weight range keeps children safely harnessed longer. The only convertible car seat rated to 85 pounds! Safer side impact protection thanks to Air Protect®: Advanced air cushion system protects your childs head where its needed most in a side impact crash. FlexTech system for multi-directional energy management. Perfect Fit one-hand harness height adjustment with micro-adjustments for a customized fit and better safety. Not just easy to clean. The seat pad and harness covers are removable with simple snaps, and theres never a need to uninstall the seat or rethread the harness to get the pad on and off. Unlike most car seats, the Pria 85 seat pad and harness covers are both machine washable and dryer safe. CosiCushion premium fabrics and padding provide the most comfort for child. Deep rear-facing adjustment, making is easier and faster to correctly install in rear-facing position. Integrated gripping cup holder securely holds drinks during the ride. Thank you so much for your interest in our items. The item "Maxi-Cosi Pria 85 Air Convertible Car Seat in Passionate Pink Brand New" is in sale since Tuesday, November 3, 2015. This item is in the category "Baby\Car Safety Seats\Infant Car Seat 5-20 lbs". The seller is "capitalkidz" and is located in Towson, Maryland.